SEGUIN ISLAND, ME - The Wireless Society of Southern Maine ventured to Seguin Island, on July 26th, to take part in the RSBG IOTA Contest. The 16 member team, which included 11-year-old Willie KC1AKU, and Stefania YO9GJY, who visited from Romania, operated from multiple stations that were setup near the lighthouse. 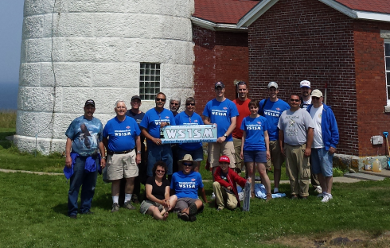 Join us for the 2014 Maine QSO Party! 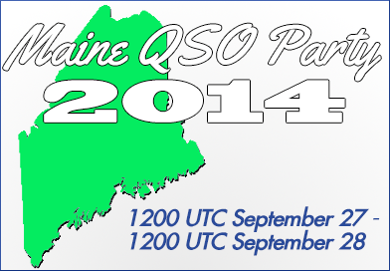 The 2014 edition of the Maine QSO Party takes place September 27, from 1200 UTC and continues for 24 hours. Maine stations are encouraged to take part and, if possible, consider going mobile or activating a rare county. Last year we had worldwide participation and awarded national winners from as far away as Australia, Germany, and Romania. Join the fun! For more info, and complete rules, click here. 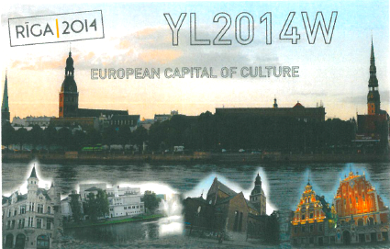 Here's a QSL card received recently by YO9GJY, for QSOs on 10m, 15m, and 17m. The special call sign commemorates Latvia's capital city of Riga as being named the European Capital of Culture for 2014. LUBEC, ME - On August 16-17, WSSM members ventured to Lubec, Maine to activate West Quoddy Head Light for this year's International Lighthouse and Lightship Weekend. This year's ILLW saw more than 500 lighthouses in almost 90 counties participate. 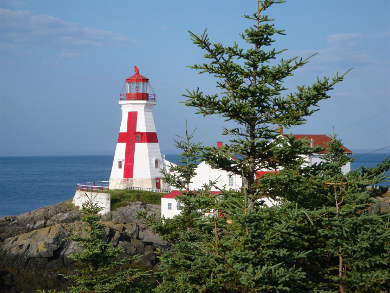 WILSON BEACH, NB - During the afternoon of August 17th, members of the WS1SM team crossed the border into Canada to activate East Quoddy Head Light, on the northern most point of Campobello Island. Despite fending off a few rain showers, we were able to operate HF and VHF as VE9/WS1SM, to become the first to activate this popular lighthouse. LONDON, U.K. - After some false starts, on October 18, 1924, two-way radio communication was finally established between Frank Bell, call sign 4AA, a sheep farmer in South Island, New Zealand, and Cecil Goyder, call sign 2SZ, operating from Mill Hill School in North London. The Wireless Society of Southern Maine would like to welcome the following new members: Carlos DeLima KC1CJH, and Orion DeLima KC1CJG of Saco, Jordan Tebbs KC1CJI of Cumberland Center, and Ryan Blankenship KC1BUN, of North Waterboro! Its hard to believe that August is almost over, and our summer expeditions are behind us. But looking back, we made some great memories over the last few weeks! Our first outing since Field Day brought us to Seguin Island, where we setup to operate during the RSGB IOTA contest. We packed up all our gear aboard a boat which left from Fort Popham, and unloaded by way of an inflatable dinghy on a small beach on the island. From here, we packed our things on a tram that carried it by rail up the steep incline to the lighthouse, as we hiked along a trail to meet it at the top. Once there, we spread out and setup a pair of HF stations and one for 2 meters. The 2 meter contacts wouldn't count for points in the contest, but it gave lots of local hams the opportunity to work us and collect the special QSL. Despite fighthing poor conditions on HF, we made a respectable number of QSOs and to make it even more special, we were joined by YO9GJY, who's first impressions of Maine included a boat ride, amateur radio, and an up-close encounter with a lighthouse! We were also joined by our youngest member, Willie KC1AKU, who had fun operating radio and hiking the various island trails with his dad, Bill NG1P. 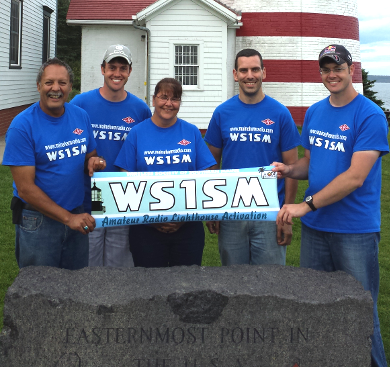 This past weekend, the WS1SM team was at it again - this time activating one of the most famous lighthouses in Maine - West Quoddy Head Light, for International Lighthouse and Lightship Weekend (ILLW). Our special event was in high demand, and we made close to 200 QSOs during the weekend! Before leaving for home, 3 team members, including Ryan Michaelson KB1YTR, Thom Watson W1WMG, and myself, drove to the northernmost point of Campobello in New Brunswick, Canada, to become the first to activate East Quoddy Head Light for ILLW. We operated as VE9/WS1SM until heavy rain forced us to breakdown late in the afternoon. Before I close, I'd like to congratulate everyone who earned or upgraded their licenses at our most recent VE session, on July 31st. New licensees include: Carlos DeLima KC1CJH and his son, Orion KC1CJG, of Saco, as well as Jordan Tebbs KC1CJI, of Cumberland Center, who all earned their Technician licenses. Stefania Chiruta KC1CJJ, earned her Technician and passed her General exam! - and Ronello Vaughn, KC1AOT, of Denmark, passed his General and Extra exams! Best of luck in your future amateur radio endeavors, and hope to meet you all on the air soon! Wishing you happy contesting, good DX, and lots of late summer fun!